It was held in ancient times that the Twins were the builders of cities and the founders of empires. 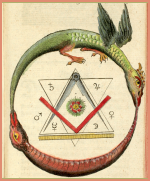 Picturing the section of the zodiac related in a natural birth chart to brethren, thought and travel, and ruling the hands and arms of human anatomy, the stories about them show skill in the use of tools, dexterity in war, and often relate to travel. In Peru they were believed to have built the first city, the symbol for them there being a pile of brick; and Rome is held to have been founded by Romulus, after his twin brother, Remus, had been slain in a quarrel over building a wall. They had reached the site of the future metropolis as infants, drifting down the river in a boat which there found lodgment in the marshes. The Romans thus regarded the heavenly Twins as exerting a special power of protection over them. Because they relate to travel they were frequently pictured with steeds, and Grecian temples thus retain them, riding side by side, armed with spears, on snow-white horses. The Romans, adopting the idea, struck a coin in their honor. The pence of the Good Samaritan was such a silver piece, on which the two horsemen were shown. This protecting power of thought and skill was honored so greatly in the time of Imperial Rome that it entered into the customary oath. On our witness stands the Bible, as the sacred word of God, is considered the emblem of that high power which none should dare defy; but in olden Rome the solemn token of the sacred power by which they swore was Gemini. Passing to a less reverential generation, By Gemini, which to us is, By Jiminy, became a by word of the street. Six hundred years after the devotion displayed to David by Jonathan, and three hundred years after the founding by one Twin of Rome, lived Dionysius, the tyrant of Syracuse. The Pythagorean sect then flourished, and to those who joined its ranks, revealed the teachings of the still more ancient Stellar Wisdom. Damon and Pythias were such followers of the great Samoan sage, developing their spiritual powers and learning about numbers and the stars from the same ordained instructor. Thrown constantly together in the school, a strong attachment formed between them, and their friendship grew as the horizon of their knowledge widened. 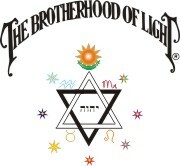 The bond of religious brotherhood was strengthened by personal admiration. Then Pythias, through some political indiscretion, came under the disapproval of the monarch and was condemned to die. He was a man of varied interests, and financial matters, due to his absorption in his studies, were rather at loose ends. Thoughtful of others, who might be left destitute by his sudden passing, and of debts that rightfully should be paid, he begged the tyrant liberty long enough to set right these various affairs. Quite naturally, the one who had condemned him to death wanted to know what assurance could be given, if he were allowed temporary freedom, that he would come back, and be present on the day of execution. Whereupon friend Damon stepped forward, pledging himself, standing ready to be slain if Pythias failed thus to return. In this manner, therefore, was the matter settled. Damon was kept under closest guard, and as the day approached, speculation ran high whether Pythias should die or Damon. Some thought the teachings of the initiates in the school to which they both belonged had so imbued the friends with a sense of honor that, even though his life be forfeit, Pythias surely must return. Others, more numerous and more highly vocal, expressed their belief, and backed it with a wager, that he had made good his escape, having fled to some foreign land. On the death day excitement ran high and a huge crowd gathered. Damon seemed the least concerned of all. And sure enough, as the time for the fateful ceremony drew near, here came Pythias striding through the gathering, to take his place before the executioner, true to his word and true to his friend. So impressed was Dionysius with this loyalty of friend to friend, and with teachings which gave so high a sense of honor, that not only did he free Pythias, and spare his life, but he also asked to be admitted as a member of the Pythagorean order. No less dramatic, and also concerned with the absence of one, is the Greek story of Castor and Pollux, after whom the heavenly Twins are now named. They fell in love with the daughters of Leucippus. But as these maidens already were betrothed to the sons of Aphareus, resentment was expressed by these earlier suitors toward the Twins. At last the rivalry ran so high that insult was passed, resulting in a challenge to battle. In the course of the ensuing fight Castor was slain. So great was the attachment of Pollux for his brother that he walked up and down the earth, disconsolate and filled with sadness. Interest in life had departed, and he longed to die, but this he could not do, for unlike the absent brother, he was immortal. Jove, from his Olympian heights, perceiving the vast distress in the heart of the surviving Twin, took pity and permitted Castor to share his brother�s immortality. Yet in granting this favor he made the stipulation that but one of the two could be on earth at a time, the other remaining meanwhile confined in Pluto�s dark realm. The mind of man, after the manner thus described, is acknowledged to be two, the objective and the unconscious, linked inseparably so long as earthly life shall last. The objective mind being dependent upon the physical brain for expression, is, like Castor, subject to the forces of death. But the unconscious mind, persisting in the astral realms after the dissolution of the physical, like Pollux, is, in truth, immortal. The conscious, or objective mind, embraces those states of consciousness, thought, feeling, and visual images, which, through the etheric energies that connect the four-dimensional and the three-dimensional form, impress themselves strongly on the physical brain. Castor is mortal, because when the physical brain ceases to function he exists no more. Yet when Castor is on earth, when the objective mind is active as in the fully waking state, the unconscious mind, Pollux, is below the threshold of consciousness, unable to express except imperfectly on the physical plane. He is chained in the realm of invisible forces, in Pluto�s dark domain. But when Castor finishes his daily sojourn, and departs through the processes of sleep, himself to enter the realm of darkness, it is then that Pollux holds full sway. In dreams the unconscious mind finds experiences such as it desires, visits the halls of learning, and weaves a pattern of fantasy which, more frequently that not, is all the memory it brings back to relieve the monotony of the waking state. Jonathan and David were like Castor and Pollux in the eternal bond of their affection. And just as David was wont to soothe the troubled spirit of King Saul by playing on a harp, so is that harp still pictured, as anciently, held by a heavenly Twin. When Saul sought the life of David, it was Jonathan, who loved David as his own soul, who saw to it that he escaped. He made a point of reporting to him every whim and purpose of his father; and on one occasion when the peril was most high, he devised a means by arrows, that David should be enlightened that danger threatened. A place was appointed where David should come in hiding to receive the signal agreed upon. A bow and arrow are still to be seen clasped in a Twin�s hand, and the robe is there also which was given to David. Three arrows were to be shot, as if Jonathan were practicing at a mark. If he spoke to the boy with him saying, as he started to retrieve the shots, that the arrows were this side of him, David was to know that he was safe. But if he said, as he was compelled to do, that the arrows were farther on, it should be a signal for David to depart in haste. On still another occasion it was his wife, Michal, who saved David from the wrath of her father. This was accomplished by using a pillow of goat hair, and covering it with cloth, as if it were David prostrated with a fatal illness. The bed was brought to Saul at his command, with expectation that he would hasten the demise, but the one he thus sought to destroy had meantime effected his escape. Thus again was the goat employed, as so often is the case, to symbolize the power of use. David possessed ability, and after the manner of the adjoining decanate of Taurus, in which a goat and her kids are pictured in association with the Master, Elijah, it is made plain that his powers were not being employed for selfishness, but for the good of the nation. So long as David worked constructively, so long as his thoughts were directed to the accomplishment of some good end, he was helped by those nearest to him. And to the extent that any other person is able to live a completely constructive life, will he also receive the maximum benefit from his environment. Nor is the harp pictured with the heavenly Twins without great significance; for to the extent thoughts are joined harmoniously, as were joined Damon and Pythias, Castor and Pollux, David and Jonathan, do they enter into beneficial compounds. Thoughts that are born at the same time, that arc presented to the consciousness in association, become linked together in such a manner that they present a united action. The thought cell so formed works from the four-dimensional plane, with such energy as it possesses, to attract events relating to it into the life. To the extent there are discords present it attracts misfortune, but to the extent there is that harmony which the harp symbolizes, does it work to attract events which are fortunate into the life. The Key phrase for that section of the zodiac where the Sun is from May 21 to June 22 is, I Think. The text, therefore, is: Thoughts Are Man�s Most Potent Builders. Way to the north, where they may be seen circling close to the celestial pole, is the constellation of the Big Bear and the constellation of the Little Bear. A Middle Sized Bear is not shown; for the middle decanate of Gemini, instead, is pictured far to the south as a good sized dog. Not only are we led to expect, because Gemini is the natural ruler of thought, that the constellations picturing its decanates shall relate to mental processes, but the stories of David and Jonathan, Damon and Pythias, Castor and Pollux quite prepare us to recognize in the bears a further elaboration of teachings relating to the two types of consciousness. Bears, in addition to unconquerable restlessness, and their habit, like mind, of devouring everything presented that has possibilities as food, have unusual feet. They are plantigrade, as is man, walking not upon their toes as most beasts do, but upon the soles of their feet. The feet of a bear are mentioned in Revelation; and in Second Samuel, 17, it speaks of men that are chafed in their minds as a bear robbed of her whelps in the field; indicating recognition of this largeness of understanding and restlessness which associates the bear symbolically with types of mental activity. Taking the two bears to signify objective thought, which in its latest development becomes reason, and unconscious thought, which in lower forms gives rise to instinct and in man to intuition, next must be decided which bear relates to the latest form of thinking. If we follow the simple system employed by the wise ones of old in their starry portrayals as similarly we followed it in learning the order of pictorial succession, we are led to conclude that the mental activity which first developed is that which also appears first in the constellated pictures. The Little Bear, exemplifying that section of the Sun�s warm path from May 21 to May 31, coming first, reveals something of import regarding the unconscious mind. Just what that something is, let us try to learn from legendary stories about the little bear. Some American Indians recognize the constellation as a Dipper and some as a Bear. Because of its form, just as Whites do, they often refer to it as the Little Dipper. But in general throughout the world the Pole Star, at the tip of small bruin�s tail, is given a place of special honor. One legend of wide diffusion among the American tribes is that once a hunting party of Indians lost its way and its members were in grave doubt as to the direction to go to reach their home. It was such a serious matter that they very earnestly prayed the Great Spirit to give them proper guidance. No sooner had the prayer been finished than a little child appeared in their midst and proclaimed itself the spirit of the Pole Star. Following it, as plainsmen and woodsmen commonly at night look to the Pole Star to give them direction, they were guided safely to their home; and ever since that time Indians have recognized the orb, whose spirit is like an innocent child, as the star which never moves. When they died the huntsmen who were thus guided were carried up to heaven where yet they may be seen as the stars of the Little Dipper constellation. Now that which is ever the same, changing not, but immovable, and which like the Pole Star is the best of all guides, is Truth. It is the Rock of Ages, upon which any lasting church must have foundation; the rock which the Psalms proclaim is higher than I. Thus to the Greeks was the Pole Star known as Mount Olympus, the abode of the gods; a mountain so high that birds could not fly to the top of it, nor clouds collect upon its summit. Truth is never cloudy, nor can the thoughts of men ever soar to its utmost height. The Big Bear in the sky, by means of its pointers, indicates the way to Truth, but the tail of the Little Bear actually touches it. As the Pole Star is reached by the Little Bear�s tail, so are there faculties of the Unconscious Mind by which Truth can directly be apprehended. The Objective Mind, with its mature powers of Reason, is a long way removed from the infantile stage. Not only is it full grown, but also sophisticated and often ruthless. Suggestions offered it are met with skepticism. But the Unconscious Mind, as dream life reveals, is not so critical. That which Reason, when it is brought to bear, calls impossible, takes place in the fantasy of dreams. For that matter, it also takes place in the reality of the four-dimensional realm, where the restrictions imposed by three-dimensions no longer hold. This naivet� with which the Unconscious Mind accepts conditions that the Conscious Mind rejects as illogical leads to associating it symbolically with a little bear or a little child. As the Indian legend indicates, so the Bible also asserts that the kingdom of God must be received as a little child. There is a faculty of the unconscious mind which feels assured when things are right. Thus did little Goldilocks, in the nursery tale told over much of the globe, always find the possessions of the Little Bear just to her liking. The Things which belonged to the Great Big Bear were too coarse and rough for her; and those of the Middle Sized Bear were also uncomfortable; but the Little Bear�s were just right. You doubtless remember Goldilocks, the little girl who lived near a forest covered mountain, like Mount Olympus, and often went for a walk in the woods. One bright and sunny morning she had gone farther than usual, picking the pretty flowers, when she came to a house, and as the door was unlocked she entered; much as we enter the physical world. But this was the house of the three bears. We call them Reason, Impulse and Intuition. The bears were out for a stroll in the woods, while the porridge which Mother Bear had made—and what a porridge Impulse often makes of life—had been left, already poured in bowls, on the table to cool. So as Goldilocks was hungry she sampled the food. The great huge bowl of porridge was too hot, the middle sized bowl of porridge was too cold, but when she tried the little wee bowl of porridge, it, like the Intuitional appraisal of life�s experiences, was neither too hot nor too cold, but just right. After eating her fill she tried the chairs. The great big chair was too high for her, and the middle sized chair was too low, but the little wee chair was neither too high nor too low, but just right. These were not immobile chairs. They were such as typify action; for Goldilocks rocked and rocked until the little chair broke all to pieces, as in the end man�s body always does. Then she went upstairs where there were beds; beds that symbolize rest to the body after the assimilation of grueling experience and the destruction of physical tissues through the monotonous rhythm of the daily toil. The great huge bed of Reason was too high for her; for the reasoning process is a foe to sleep. And the middle sized bed of Impulse was too hard; she would have tossed and turned if she had attempted to rest there. But the wee little bed was just right; for the Unconscious Mind has full charge in slumber and Intuition can then impress its guidance through the avenue of dreams. Such impressions are more easily recognized in the moment of waking. Of course, Intuition often is active at the very moment some situation is presented, giving instant appraisal of its possibilities and its outcome. But more often than not the Great Huge Bear of Reason so intrudes its ungainly force that the wee small voice of Intuition can not then be heard. But if listened for, it can be heard readily in that transition state between sleep and waking. When the three bears came home it was the Little Bear that discovered Goldilocks in his bed, and spoke in a wee small voice. Whereupon—just as Reason and Impulse rush in when one starts to awaken—the two larger bears rushed over to the bed, making so much noise that they frightened Goldilocks, and she jumped out the window and ran safely home, despite the Little Bear calling to her to come back and play with him. No time is quite so easy, as a rule, to hear the voice of Intuition as in this transition from the sleeping to the waking state; but its promptings must be carefully listened for and noted before thoughts begin to clamor in the mind. It is because Reason and Impulse so often intrude and create a clamor that the promptings of the unconscious mind should be subjected to whatever method may be available to check their accuracy. 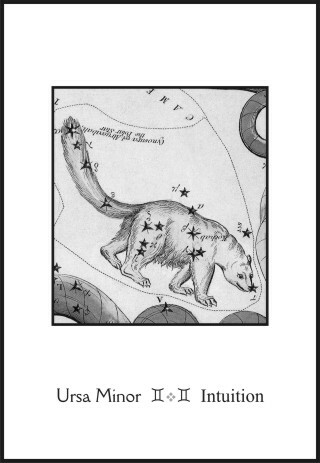 Like the Little Bear�s tail, Intuition, which is the Key word for the decanate this animal pictures, is in constant touch with the Pole Star. Truth. But its voice is easily deflected and is often misunderstood through the crowding influences of other forms of thought. Not that the unconscious mind is able to apprehend all there is to know; but, because it draws information from the reports of both the physical senses and the four-dimensional senses, having access to both realms, its possibilities of acquiring information are vast. In the astral realm the process of tuning in on the knowledge desired makes the more laborious methods of earth quite unnecessary. When the unconscious mind realizes what is expected of it, it will endeavor to meet the expectations, traveling in sleep, using the faculties of clairvoyance and clairaudience, and the tuning in process to acquire information. Yet after it has collected facts from both the outer and the inner plane, and from them has formed correct conclusions, there is still the more difficult problem of getting recognition from the objective consciousness. Only through training can its voice be heard. Yet the text is clear: Only Through the Intuition Does Man Contact the Real Underlying Truth of Things. The marriage decanate of Gemini, so called because it has a sub-influence ruled by Libra, the marriage sign, is pictured by a dog. This dog is not fat and plump. 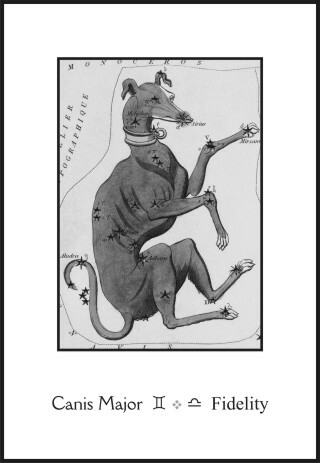 Thought, to which the sign as a whole relates, is swift, therefore, this dog is long of leg and speedy, like a hound. Character is the real man, the whole man, and represents a fusion, or marriage, between the unconscious mind and the objective mind, whose powerful activities are portrayed by the bears. And because character is the truly important thing, in placing its pictographic symbol in the sky it might be expected that the ancients would use in its portrayal the most conspicuous of all the stars. Sirius, the star in the mouth of the greater dog, is the most brilliant star in the whole expanse of sky. 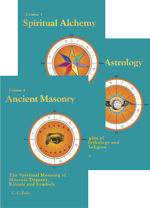 Joining, as it does, the Reason section of the zodiac with that section relating to Intuition, one can not help but wonder how much the ancients knew regarding it, how much was coincidence, and how much was an intuitive recognition of the real nature of the Dog Star, Sirius. The star, like thought and like the hound, has a rapid proper motion. That is, relative to other stars it is moving at tremendous speed. And it is not one star, as to the naked eye it appears, but Twin stars, united, or married, by the mutual pull of gravity, and thus revolving around a common center; bound together by a tie as inseparable as that which held Castor and Pollux. But more amazing still, the companion star, the smaller of the two, has a density incomparable to anything known on earth. Forty thousand times as dense as water, more than a thousand times as heavy as platinum, an amount of it such as might be placed in the pocket of a boy weighs not less than a ton. Like planets revolving around the Sun, and with space between as large in proportion, the electrons of all atoms of matter revolve around the nucleus at the atom�s center. And it is supposed that the pull of the nucleus at the center of the atoms on the companion star of Sirius, under conditions which are not understood, became so great that the atoms collapsed. The positive and negative charges entered into a still closer embrace to form a type of substance that no longer can be considered atomic; a substance having a distinctly different character to anything existing on the earth. Very much as electrons and protons, united in a miniature solar system, are part and parcel of every atom of matter, so while man functions through a physical body the conscious and unconscious minds unite to contribute to his character. As the dog is an animal which frequently gives warning of danger, like the voice of conscience protesting against the trespass of wicked deeds, and as both reason and intuition unite to apprise of other peril, so the Dog Star in ancient Egypt gave warning of the flooding of the Nile. In the spring of the year this brightest of stars is visible just after sunset. But each evening it sets about four minutes earlier, so that as the season advances it is closer and closer to the Sun, until there comes a time when it is so close to the orb of day that it can no longer be seen. Then some fine morning, to anyone ambitious enough to be up, it may be seen as a morning star, heralding the approach of the rising Sun. This first visible appearance of Sirius before the Sun was of great importance to the Egyptians because it timed the yearly approach of an event which to them meant life or death. They were an agricultural race, dependent upon the harvest for sustenance. That harvest, in turn, depended upon the flooding of the Nile. The raising of crops, year after year, on the same piece of soil is made possible only when the elements removed are in some manner replaced. It is customary for men to spend time and money thus to prevent the wearing out of their ground. But in Egypt, each year, the Nile did this for them, overflowing its banks, depositing a thin layer of rich new silt, and in addition giving the farms a very necessary soaking. Egypt was dependent for her life upon this flooding of the Nile. The civilization which persisted for thousands of years was made possible by it. Is it any wonder then, that the brilliant star which heralded this event should have received unusual homage! Its first visible appearance before the Sun marked the commencement of their year. It was the first of the month of Thoth (Mercury). Were this not known historians would have a sorry time with ancient chronology. It serves them as the reference point from which to calculate the past. There was a vague year of 365 days and a sothic year of 365� days. 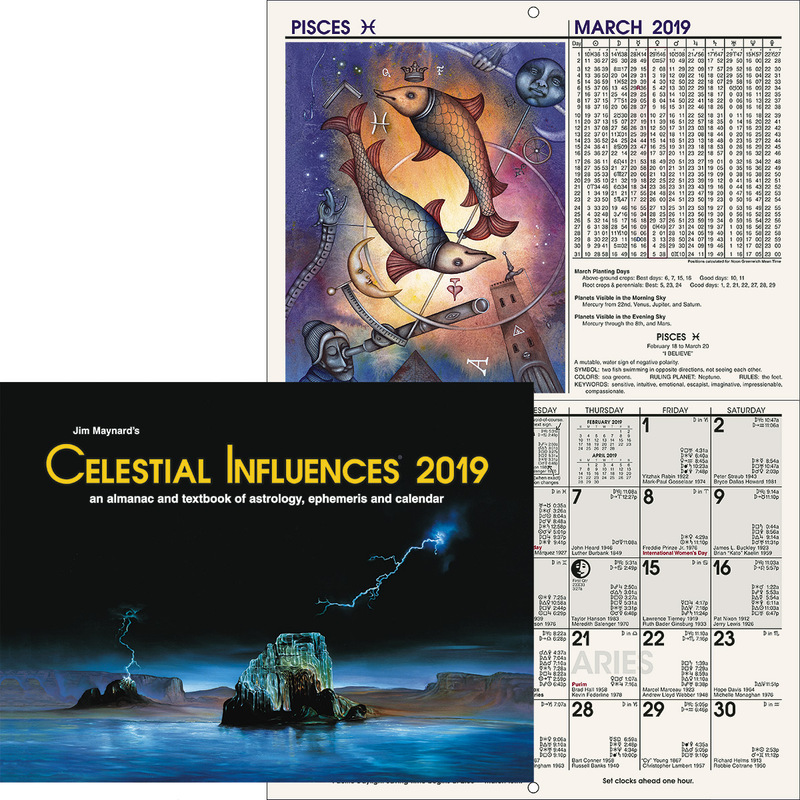 The coincidence of the two calendars after 1461 vague years or 1460 sothic years gave them a Sothic period. And it is on record, fortunately, that one such Sothic period commenced on the first day of Thoth, in AD 139. Each year it was the custom, on this first day of the month of Thoth, for the Pharaoh or one of his sons to go early to the temple. Then, just as Sirius came into view, and its rays shone through the temple and fell directly upon the shrine, to make an offering of papyrus and of lotus flowers. This officially commenced a festival which the populace celebrated with fervor and pageants of splendor. When Sirius thus rose ahead of the Sun, Etesian winds were piling moisture from the Mediterranean against the interior mountains, and soon the resulting rains would bring inundation. It was time, so the dog in the sky warned them, for farmers to move their household goods to higher ground until the flood had passed and it was safe for them again. Thus the constellated dog may be seen keeping a watchful eye on the rising river. And although, due to the precession of the equinoxes, the time of this event is now earlier in the year, when the Greeks and Romans first contacted the Egyptians, the first visible rising of Sirius before the Sun commenced the close sultry days of summer, which because of this were called dog days, and are still so termed in many parts of the world. Canis Major is a friendly dog with his master�s welfare dominant in his heart. Ever faithful to the trust imposed in him he willingly risks his life in the protection of his human friends. The Sun is in the Fidelity decanate he pictures from June 1 to June 12. As man looks up to God in service and devotion so does the faithful dog look up to man. No other animal habitually displays these qualities which in their fuller bloom become the flowers of religion and altruistic action. As pictured in the sky he is not fleeing in terror from the rising water. He is merely warning that temporarily it is better to repair to higher ground. The soil can bring forth its fruit only when it thus has been moistened; and the earthly life of man acquires a healthy harvest only when the finer, kinder qualities of affection have softened its hard, dry selfishness. The great dog in the sky portrays the character of man, which warns him when the emotional tide runs high enough to bring him peril; and leads him back again to moist and fertile ground when there is safety. But when he develops fear of water, when the character no longer is swayed by the softer, kinder sentiments, he, himself, becomes a greater peril. To turn loose the dogs of war, was a customary expression in the days of ancient Rome. And when the character of a people develop madness, as a dog develops rabies, it seeks to find expression in acts of military aggression. Hydrophobia means to have a fear of water, and those engaged in war must of necessity shun contact with those finer, kinder emotions which give quality to the soul and build for it an enduring spiritual body, such as symbolized by the stellar river. Instead there is the cruelty and wanton destruction so well expressed by the mad dog which tradition says thus shuns the water. This is the worst of the whole affair, that one nation in the world affected with this military madness endangers every other nation. As a dog with the rabies bites right and left with no discrimination, so one jingo nation infects the others. None can disregard the threat of its armament. And each thus infected country, strengthening its powers of destruction, becomes a source from which the malady spreads to others who are fearful of its possible aggression. And so, from one country to another, does the disease move forward. Nor apparently is there any prevention of the spread of this dread madness except through the restraint of the nation where it develops, suppressing it at its source. Still another form occurs within a nation. Reasonable hours of labor, reasonable wages, and kindly working conditions for those employed are the dictates of proper character and in the interest of the universal good. But one firm developing the cruel traits of competitive madness, lowering wages, lengthening hours, making living conditions impossible as one nation infects another with vast expenditure for armament—compels other firms in the same business to develop like methods to prevent being bankrupt. Mad dogs of industry and mad dogs of military aggression must be restrained for the protection of all, themselves included. But such madness primarily is that of character. There is no real benefit to the individual that can be purchased at the expense of the universal good. It is a sign of hydrophobia when, within the law or without it, the attempt is made to racketeer. The good of any man resides in his character, and his character is sound only so long as it has due regard and sympathy for the interests of others. The text therefore may be expressed in the words of the bard of Avon: "This Above All; To Thine Own Self Be True; And It Must Follow As the Night the Day, Thou Canst Not Then Be False to Any Man." In the long ago there was a race of giants whom the Greeks called Titans. They were very powerful and became arrogant with the knowledge of their strength. In this they were not unlike some scientists of the present day, who triumphant in their conquest of certain laws of matter, believe no information of importance, of a different nature, can lie beyond their ken. So certain of themselves did these giants become that they decided to storm the gates of heaven and dethrone the gods who resided there. That is, like Soviet Russia at the present time, they deemed there was no power superior to the physical. Brute force and intellect seemed to them supreme, and in their atheism they sought to overthrow the very judgment seat of God. Still further back in Bible times another race of men had kindred thoughts. The sign Gemini, the third decanate of which is pictured by a Giant Bear, relates to building, the Peruvian symbol for it being a pile of bricks. Such bricks were used, as described in Genesis 11, on Shinar�s plain to construct a city and a tower, whose top should reach to heaven. The Sun while in this decanate of Reason, from June 12 to June 22, like the laid brick tower of Genesis, the barrows and pyramids of various lands, and the mountains which the Titans piled up in their invasion of the dwelling place of God, mounts higher and higher in the sky. Only at mid-day on the 22nd of June does it reach its highest, most northern, declination. This is the longest day of the year, the nearest approach of the earth to gaining perpetual light. But the Sun, at the end of this giant decanate, ascends no higher. The Titans are defeated by the power of Jove, whose Sagittarian sign across the zodiac opposes to Intellect and Reason the mandates of true religion. 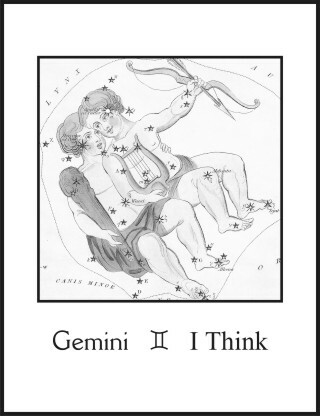 Gemini relates to thinking, but no less also to the expression of thought in speech. On Shinar�s plain, therefore, the defeat of those who assaulted heaven with Babel�s tower was accompanied by a confusion of tongues, and a scattering of forces, such as those born in this sign find often to defeat their ends. And the Titans, like scientists who pile up facts to refute the possibilities of an after life, to have other greater groups of facts piled over them, were buried under the very mountains they had erected; and their blood, as the essence of atheism always does, gave rise to a race of ruthless men. It is not to be inferred from this defeat that Reason is without its proper use, or that the Titans had not a proper function. Reason should be used wherever possible to check the reports of the psychic senses and intuition. The two stars in the outer bowl of the dipper which mark the shoulder of the Giant Bear point directly to the pole star, Truth. Mariners and plainsmen and those who must find their way through the forest at night constantly use them to indicate the North Star which gives them true direction. It was the assumption that objective consciousness and the reports of the physical senses which Reason commonly employs, were sufficient in themselves to acquire the whole of Truth that led the Titans to disaster. 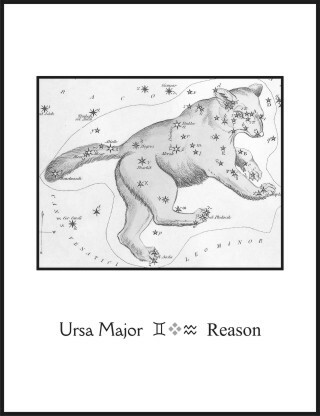 Reason, like the Pointers, only indicates the direction of Truth, which is really touched by the unconscious mind and the Intuition as symbolized in the Little Bear. Yet as affording a necessary means by which the accuracy of the findings of the other faculties regarding the inner world are tested, and when true their doctrines may be upheld, Reason has a fundamental work to do; for Atlas, one of the defeated Titans, henceforth was compelled to support the heavens on his head and hands. This Atlas, one of the fabled giants associated with the larger bear, was the father of the Seven Sisters now translated to the Pleiades. Six of these well-known stars are plainly visible in the shoulder of the Bull; and keen eyes can see the seventh, and perhaps the eighth and ninth, Atlas and Pleione, father and mother of the famous girls. Alcyone, Maia, Merope, Taygeta, Asterope and Cleaeno were quite proper in their conduct, and in due course of time, according to the conventional standards of their kind, were married to immortal gods and lived in respectability. But the seventh sister, Electra, was of a different turn, and had a disgraceful affair with a mortal lover. So great was the shame her sisters felt for her that her light died out, leaving but six stars to be seen by common eyes. Suffering from the disdain of these sisters, and still disconsolate over her lover who, being mortal, had died, she wandered far away and became lost in the cold region of the north. Thus did the Greeks identify the naked eye star, Alcor, in the constellated Great Bear as the Lost Pleiad, who previously had been Electra, and in addition to marrying a mere mortal had veiled her face at the burning of Troy which had been founded by her son. The Seven Sisters, through their residence in the Bull of material possessions, indicate their attachment to physical things. But Electra went beyond mere desire for the tangible things of life and formed so intimate and persistent a longing for such things that it veiled the light of their transitory nature from her inner sight. Like many another who has formed too strong a love for that which is mortal, she wandered in the region of cold intellect, and found her final abode in the lair of the icy giant, Reason. She was like the soul who can not turn from the thoughts of earth to higher things, even at the time of mortal passing, and thus remains earthbound for a period after death. It was at the period of the summer solstice, when the Sun has reached the end of the decanate pictured by the Giant Bear, that the Maya and the Aztecs built special fires atop their numerous pyramids. Symbolically, because the Sun was then nearer to them by declination, this represented the closest approach of the deific spirit to the earth. The day was easily ascertained; for it was the time when at noon a stake cast its shortest shadow. This northmost position of the Sun on earth, because thus so simply found by watching a shadow, was the index more commonly employed to mark the precession of the equinoxes, and thus to indicate the time of vast changes on the earth, including cataclysm. That is, when the decanate pictured by the Great Bear, representing the Tower of Babel, moves to a point in opposition to the Pleiades, associated with the decanate pictured more completely by the frightened Hare, such changes are at hand. At Uxmal, in Mexico, to indicate this relation between the solstice Sun and the northern constellation, seven pyramids were so arranged as to represent the seven bright stars of the Great Bear. The Mound Builders also had altar fires atop their piles of earth; and those who make a study of the origin of words report that such mounds in the British Isles, through "berw," the ancient name of bear, have now come to be known as barrows, after that animal, and that the Welsh name for hill, "bryn," is the original of the popular name, "bruin." At least, when Ireland was converted to Christianity one of the most difficult tasks of the good Fathers was to abolish the ancient custom of lighting fires on the tops of towers, pinnacles and conical hills in honor of the Sun. The pyramidal temples of Bel (the Sun) scattered throughout the world relate to its solstitial position. A belfry is now a cupola in which a bell is suspended, was once a tower of refuge, and at an earlier date was derived from words having to do with Bel-fires, that is, places where fires were kindled in honor of the Sun. A pyramid of soil or stone is a high point on the earth; and some of them, those more carefully constructed, were so built that the inclination of the northern side was in line with the solstice Sun, so that on the longest day at noon no shadow would be cast, but the Sun apparently would perch like a ball of fire on the summit, when viewed by those at the northern base. Thus on this day was spirit symbolically joined to matter. The pyramid or tower, as the highest edifice of man�s construction, well represented the apex of his physical attainment, the highest point reached by the objective mind. But such a physical structure in itself was limited in its function. It was like the legendary Atlas who failed in his attempt to storm the gates of heaven; but was given useful employment holding this celestial region on his head and hands. This, I believe, quite accurately describes the function of physical life, the hardships of which compel the development of the power of Reason as an effective means of escaping painful penalties. Pain is the warning that the organism is not fully successful in adapting itself to its surroundings. And to escape the pain, the organism struggles. When it is successful in making the proper adaptation, the pain ceases and pleasure is felt instead. Pleasure is the signal to an organism that difficulties have been overcome and that all is well. Ants and bees readily sacrifice their lives for the good of their fellows, a dog will die for his master, and many mother animals will defend their young to the death. We can not, therefore, place man on a pinnacle due to his altruism. But in the exercise of intelligence, especially Reason, he is as high above other creatures of the earth as a pyramid or tower is above its surroundings. Yet Reason does not perceive all. When we approach an object from one side we may see all that can be seen from that direction, but not all that may be seen from the other side. Reason and Intuition thus approach knowledge from different directions. While Intuition touches Truth, it does not get the view that Reason does, even though Reason only points in its direction. Both the inside and the outside of things need to be known to possess complete knowledge. As for the Great Bear it indicates the text: Reason Points the Way to Truth, and Offers a Valuable Means by Which the Accuracy of the Reports of the Psychic Senses Can be Tested.